For so many years we have associated luxury kitchens and bathrooms with Stainless Steel, Chrome, and Nickel fixtures and hardware. Now finishes like Venetian Bronze and Oil Rubbed Bronze are making a long overdue come-back in home design! 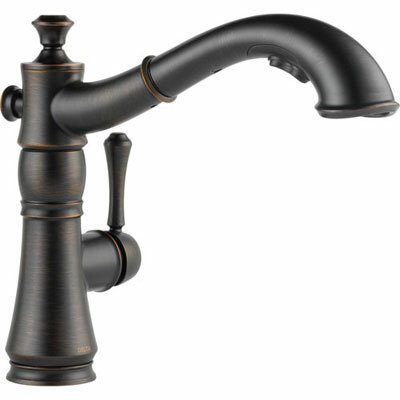 Styling your home with bronze kitchen and bathroom faucets, shower systems, and accessories not only adds a unique touch to each room, but these durable pieces are easy to care for and look great for ages! In this all-inclusive guide to bronze fixtures for the home, you will find all the answers to your most asked questions, a quick guide on how to care for your bronze fixtures, and a few design ideas we really love! What is an Oil Rubbed Bronze finish? 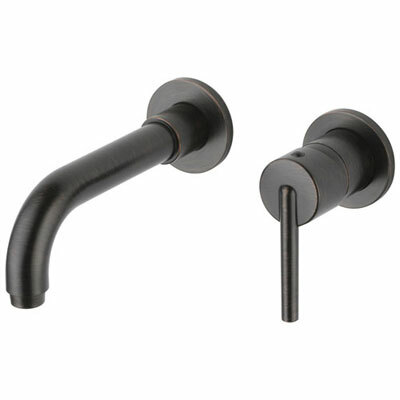 Oil Rubbed Bronze finished are made from rubbing a dark oil solution over copper plated hardware and fixtures. This oil solution will wear and fade over time, giving the fixture an aged antique look. How do you clean Oil Rubbed Bronze? 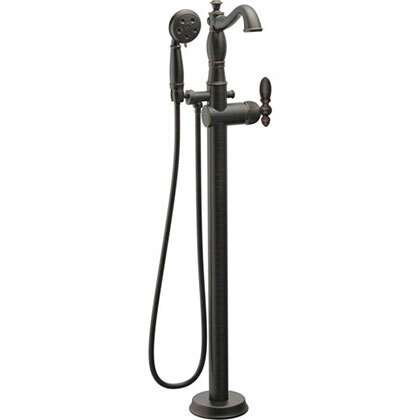 It is recommended to clean Oil Rubbed Bronze fixtures and hardware with water and a soft cloth. If your fixture has hard water spotting or needs more thorough cleaning, diluted vinegar may be used. It is not recommended to use harsh chemicals such as bleach, or abrasive sponges as they may cause damage to the finish. How do you fix an Oil Rubbed Bronze finish? Aged Oil Rubbed Bronze finishes may be restored somewhat easily. It is recommended to use a wax, such as Empire Wax, in the color that best matches your Oil Rubbed Bronze fixture. Once you have re-coated the fixture or hardware with the wax, polish the piece with mineral oil to restore the shine and further protect the fixture. What color paint goes with Oil Rubbed Bronze? 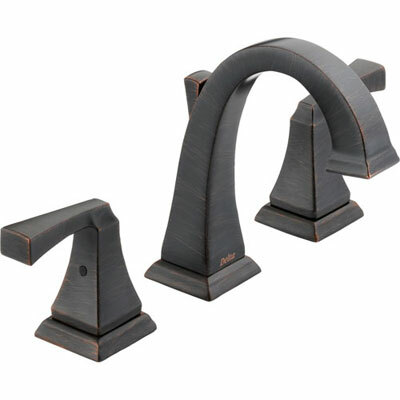 Although they are usually found in traditional designs, Oil Rubbed Bronze fixtures are very versatile. They pair best with neutral paint colors, like tans, off whites, and light grays. In most designs, Oil Rubbed Bronze fixtures are the focal point of the room, so paint colors should compliment the fixtures rather than stand out on their own. 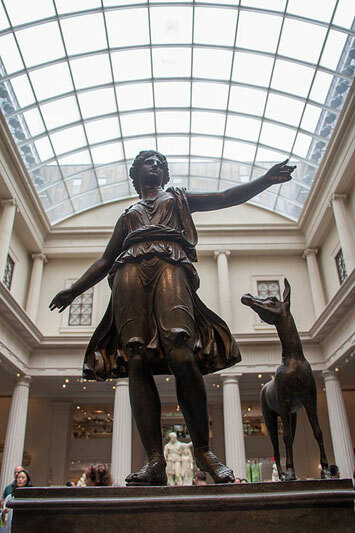 Is Aged Bronze the same as Oil Rubbed Bronze? Oil Rubbed bronze is a living finish that will age and change over time. Aged Bronze is typically a manufactured finish that mimics the natural aging process of live bronze fixtures. How do you make Oil Rubbed Bronze? Oil Rubbed Bronze finished fixtures are made from brass that is then plated with copper and rubbed with a dark oil solution. 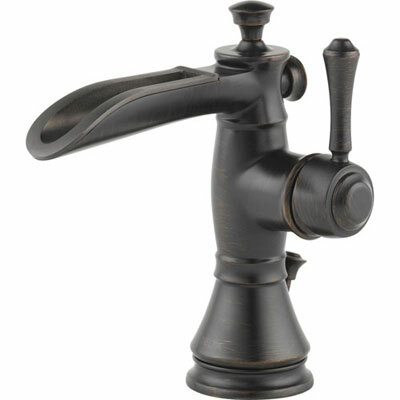 Venetian Bronze is a chemical finish applied to fixtures and hardware. This non-living finish is a rich, antique brown color made by Delta. What color is Delta Venetian Bronze? Delta Venetian Bronze is a rich, antique brown color that will never fade or tarnish. The finishing process Delta uses is so advanced they are able to offer a lifetime guarantee that the finish will never fade or change under normal use. What is the difference between bronze and Oil Rubbed Bronze? Bronze is a metal allow made from copper and tin. Oil Rubbed Bronze is a chemical finish applies to fixtures and hardware that mimics the color and aging process of actual bronze. How do you restore an Oil Rubbed Bronze finish? How do you remove water spots from Oil Rubbed Bronze? 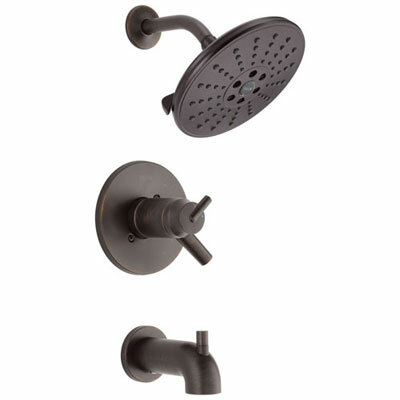 Oil Rubbed Bronze fixtures are generally more spot resistant than most other finishes. If simply wiping your fixture down with a soft, damp cloth does not remove the water spots, using a diluted vinegar solution is recommended. Avoid using harsh cleaning chemicals as they may cause damage to the finish. Bronze is one of the oldest materials used in hardware. It is created by mixing heated copper and tin, making bronze incredibly durable and strong. During the Bronze Age, this new metal was widely used to make tools and weapons. The unique color and durability of traditional bronze hardware later inspired designers to incorporate this look throughout home design. The use of bronze finished fixtures in the kitchen and bathroom became popular in the late 1990's. 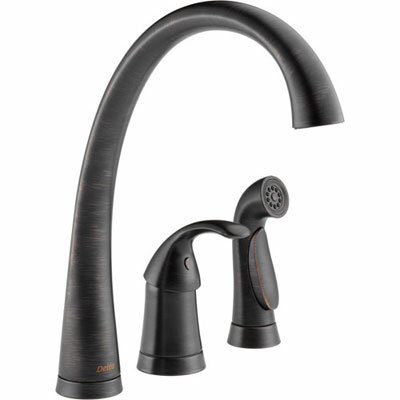 During this time there were many new and diverse finishes on the market as plumbing fixtures were becoming more of a designer focal point rather than just a functional piece of hardware. Like brass, bronze fixtures and hardware are typically made with what is known as a "living finish." During this finishing process, the manufacturer starts with a brass base and plates it with another material. Then the fixture is coated with the desired finish, typically a dark oil. A live Oil Rubbed Bronze fixture will age over time. The oil will rub off with continual use, allowing the plated metal below to peak through. 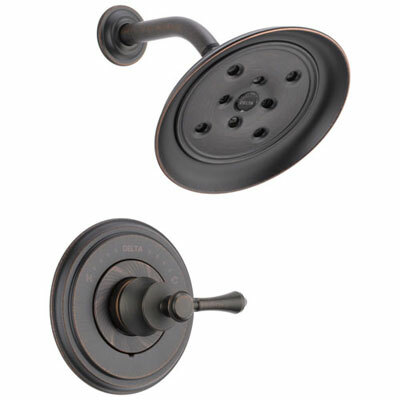 The natural aging process gives Oil Rubbed Bronze the classic antique look that these fixtures are known for. 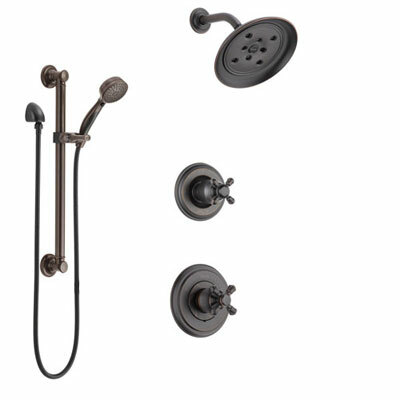 Oil Rubbed Bronze fixtures and hardware bring a traditional elegance to home designs, however, it may be difficult to coordinate this finish throughout a single space. As these live finishes age at different rates, no two fixtures of the same finish will look the exact same over time. Fortunately, Oil Rubbed Bronze fixtures are beautiful however they age, and will bring uniqueness to your home throughout it's lifespan. 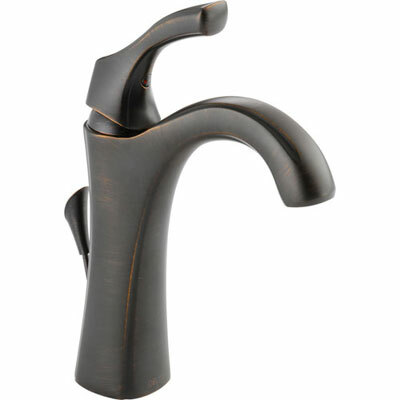 Bronze fixtures are also available in non-living finishes that do not age the same as living finishes. My favorite non-living bronze fixture is Delta's Venetian Bronze. 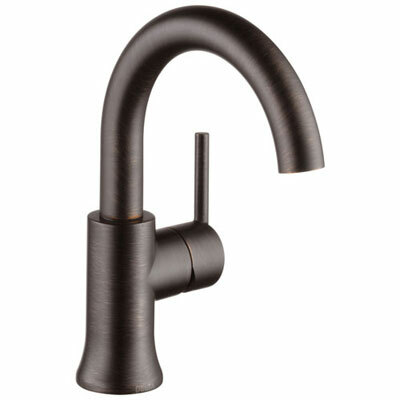 The Venetian Bronze finish is a rich, antique brown color. Venetian Bronze fixtures and hardware are more uniform and easier to match from piece to piece than Oil Rubbed Bronze finished pieces. Delta's finishes also have a lifetime warranty for all their finishes which guarantees that they will never change or fade. Venetian Bronze is generally recommended if you are looking for a fixture that will not change over time, but are still looking for a unique piece for your home design. The combination of white cabinets and white counter tops really makes the contrast of these Venetian Bronze bathroom fixtures pop! Here we see a classic, vintage design. The use of Venetian Bronze for all the accessory hardware pieces, such as the cabinet handles and door hardware, bring the entire space together, Adding different light fixture designs of the same finish complete the color scheme while also keeping the design fun and somewhat modern. 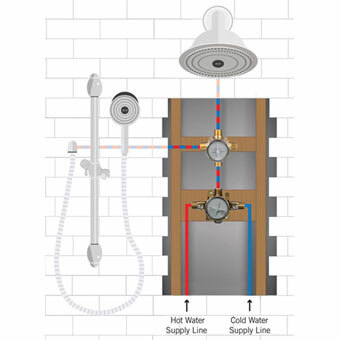 Separating the stall shower with glass rather than a closed in wall allows you to see the complimenting bronze shower head and trim. This is a great way to turn a somewhat trendy finish like Venetian Bronze into a timeless design that will last for generations. I love the look of an exposed utility sink. In a small bathroom, the use of darker finished fixtures can sometimes make the space feel tighter than it is. This bronze bathroom faucet is surrounded by a large white porcelain sink, giving the illusion of more space. 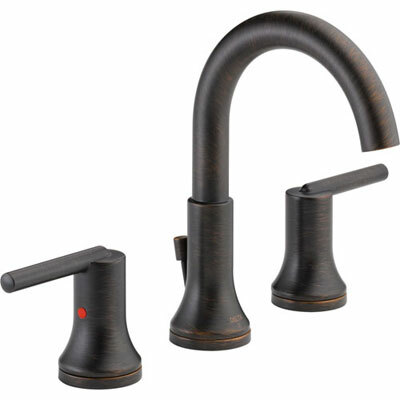 This also makes the bronze faucet more of a design focal point rather than just a functional piece. This designer did an amazing job matching the darker wood pieces with the bronze fixtures. The use of while subway tiles and a lighter wall color also keeps the room more open. I love that they also installed bronze door hardware and a matching vanity mirror to complete the entire design. In addition, the bronze finish light fixture hanging over the mirror adds a certain element of charm and the green tile floor is eclectic and fun! The one missed opportunity here is they could have gone with a finished P-trap under the sink. These days you can find bronze finish accessories like that and are not limited to white plastic only. Sometimes the smallest of renovations can make the best statement. Here we see one of the most common bathroom setups, but with a modern twist. Changing out the original shower trim for an update Oil Rubbed Bronze shower trim kit adds a more upscale feel to this bathroom design. The almost black shower fixture finish complements the black floor tile as well as the dark grout in the tiled shower. 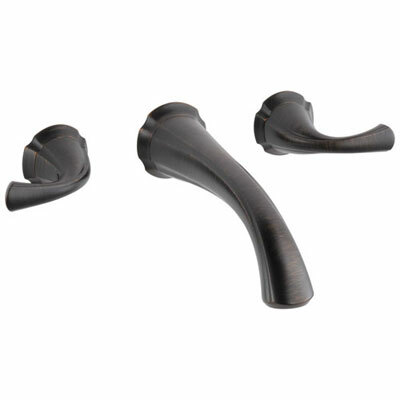 Adding little touches like a matching Oil Rubbed Bronze toilet handle and shower rod bring the entire design together for a luxury modern feel. This bathroom is a great example of how easily you can update a boring bathroom with just a few small changes. It is a common myth that installing finishes like Oil Rubbed Bronze or Venetian Bronze for your bathroom or kitchen fixtures will make the room feel small or dark. This bathroom design is a great example of how untrue that is! Here we see the use of white wall and floor tile to keep the bathroom design light and airy. 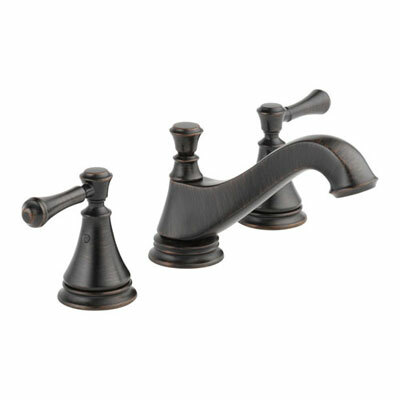 The Antique Bronze bathroom faucet complements the black accent tile on the floor for a cohesive look. Incorporating bronze accessories like a mirror and tissue holder continue the dark accents without taking over the overall brightness. Installing glass sconce lighting with a bronze finish metal base rather than the traditional bathroom vanity lighting complements the vintage design. 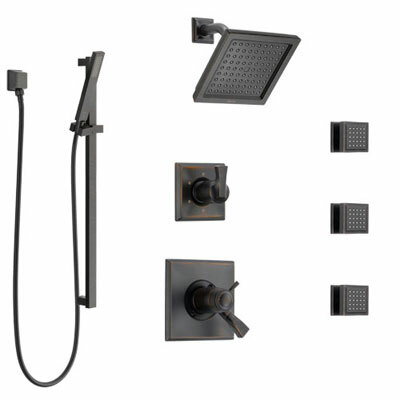 All these Oil Rubbed Bronze finishes throughout add a modern touch to this bathroom decor. We do not often see darker finishes like Oil Rubbed Bronze or Venetian Bronze being used in modern designs as they carry a somewhat vintage look. This marble shower stall with glass enclosures is a very modern style. Installing a Brushed Bronze shower system adds some great contrast to the white wall tiles. 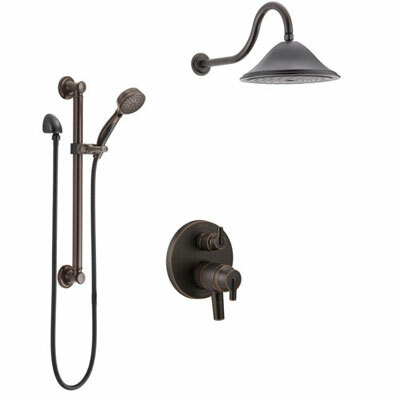 Bronze bathroom fixtures and shower door trim also give the space a few traditional pieces that are sure to keep the design current through many style trend changes. 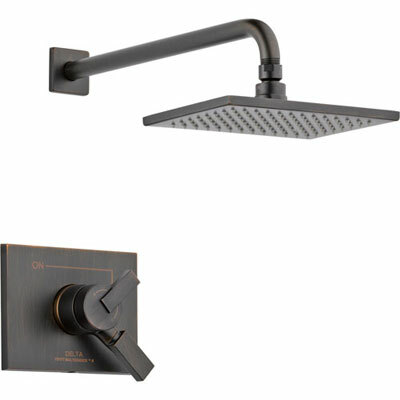 The use of dark floor tile accents make the bronze shower heads and bronze body sprays really look like they belong in the modern space. Farmhouse style bathrooms and kitchens are becoming more and more popular. The bathroom above is a great example of a luxurious space with all the character and charm that a rustic farmhouse design has to offer. 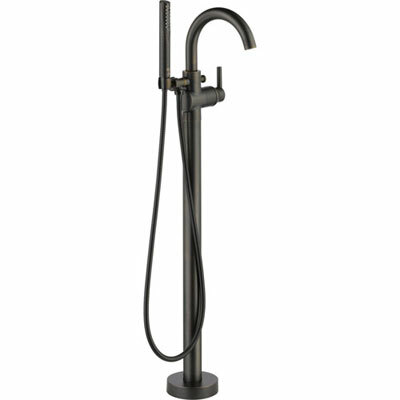 It is very common to find bronze bathroom fixtures in a design like this. The darker finish of an Oil Rubbed Bronze bathroom sink really complements the sandy wood vanity and cabinet hardware. As you can see in the mirror reflection, the use of classic subway tiles in the shower keep the rustic bathroom design somewhat modern. This design is completed with the addition of Oil Rubbed Bronze mirror trim, matching light fixtures, and shower hardware. We are unable to see for sure, but I bet the designer also installed a beautiful Oil Rubbed Bronze shower head and trim to further the eye catching contrast of darker finishes on white walls. This is a beautifully finished room! 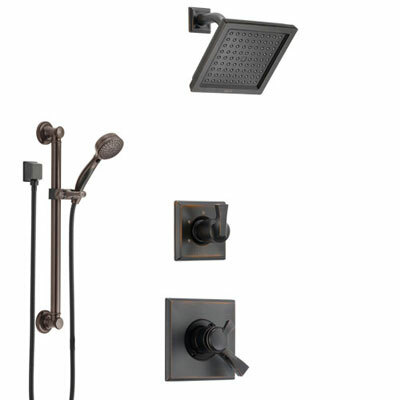 Delta Venetian Bronze bathroom fixtures are incredibly versatile! The design above is a perfect example of how Delta's Venetian Bronze traditional finish looks great in a modern style bathroom. Venetian Bronze is the perfect finish if you are looking for a design that is unique but also has an antique look. Venetian Bronze fixtures are a better choice than Oil Rubbed Bronze if you are designing a space using a somewhat modern color palette. 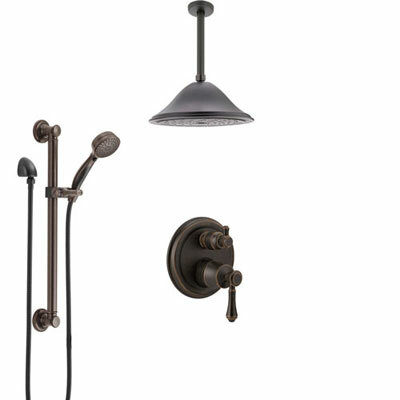 From faucets and shower trim kits, to towel bars and toilet paper holders, Delta's Venetian Bronze finish is available in every fixture and hardware piece you need for your bathroom design! Look how cool the bronze finish pairs with the white marble countertop! More surprising, is how well the bronze complements the light green walls so beautifully. The designer ties the space together by seamlessly transitioning to the cream colored vertically segmented shower tiles. This bathroom is a real masterpiece! Trends change all the time. Bathroom fixtures are no exception. This is where Venetian Bronze bathroom fixtures have stood the test of time. Since their height of popularity in the 1990's, Venetian Bronze fixtures have remained a staple in luxury kitchens and bathrooms. The dark finish adds warmth and uniqueness to a space that so often feels cold and impersonal. In the bathroom design above, we see a great example of how using the same finish for fixtures and hardware throughout a space feels elegant and complete. 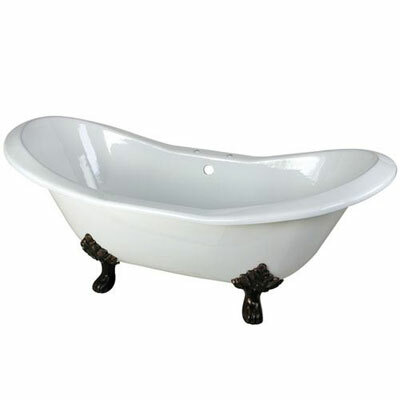 Pairing a freestanding clawfoot tub faucet with this elegant cast iron clawfoot tub gives the bathroom a relaxed elegance. The effect is heightened by the use of natural light and the clear glass shower enclosure. Note the bronze metal shower door hinges and the tasteful dark tile accents running along the wall. 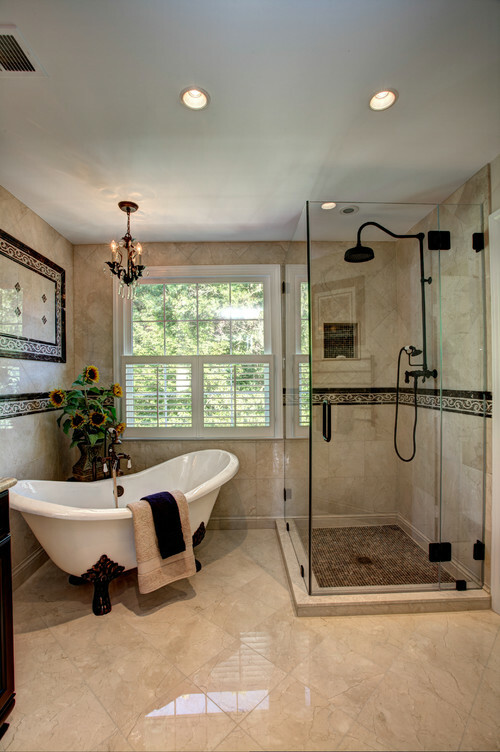 The exposed nature of the rain shower matches the Victorian style of the freestanding tub with bronze feet. Should you choose to embrace the bronze finish bathroom fixtures trend, this is a great example of the serene space that awaits! Again, look how well light green goes with bronze. The Venetian Bronze Shower System with Delta Hydrachoice Body Sprays in the back ground peaks through, looking stunning against the sea green tile. The bronze finish fixtures complement the wood tones in the room nicely as well. 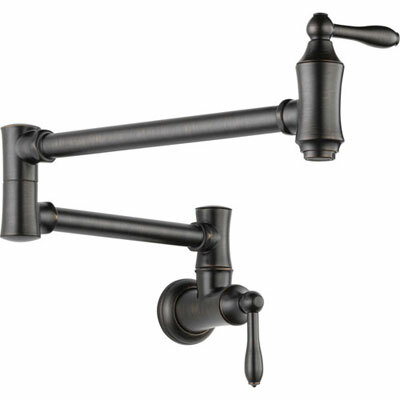 The Venetian Bronze widespread bathroom sink faucets look sharp on these double sink wall mount bathroom vanities. Bathroom accessory touches like the robe hook and hand towel rings provide the finishing touches to stunning effect. The bronze finish gives the room a contemporary feeling without being too flashy. 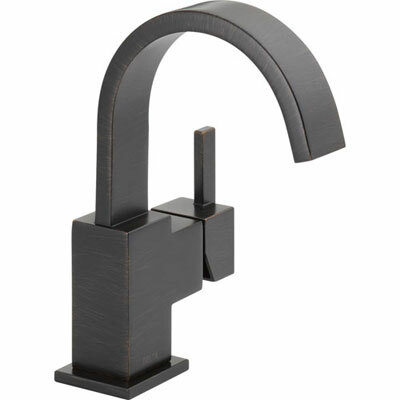 Dark bathroom fixtures are incredibly eye catching and unique, no matter what design they are paired with. 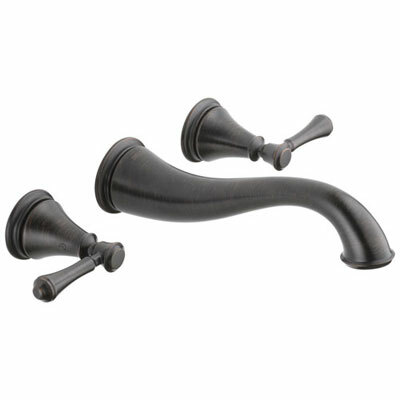 Venetian Bronze is one of my favorite dark finishes for the bathroom. 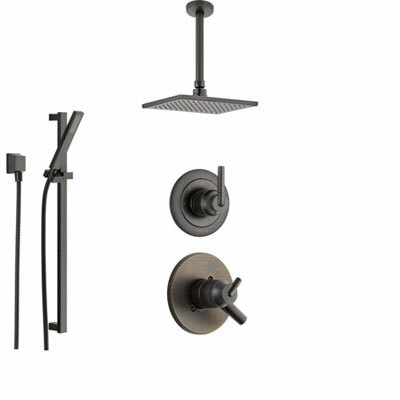 Delta's Venetian Bronze bathroom fixtures are incredibly spot resistant and easy to keep clean, making them the perfect fixtures to install in your shower system. Venetian Bronze mimics the aged and antique look of Oil Rubbed Bronze, without being subject to the same aging and wear that occurs over time. 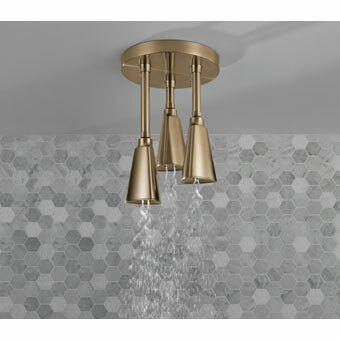 Delta also offers a full lifetime warranty which covers both the function and the finish of their fixtures, so your Venetian Bronze shower system will look amazing for years! Photo by Marsha Jones Interior Design, Ltd.
Venetian Bronze faucets and fixtures look amazing in luxury kitchen designs.The dark chocolate finish matches perfect with traditional granite counter tops, and pairs easily with popular stainless steel appliances. Venetian Bronze also pairs well with a variety of different wood tones for cabinets. In this design we see how well this Venetian Bronze kitchen faucet matches with both the white cabinets and the darker wood bar chairs. As a darker, light resistant finish, Venetian Bronze is incredibly spot resistant as well, making it one of the best choices for messier areas like the kitchen. Bronze fixtures are very durable and easy to maintain. Although most bronze pieces are living finishes, with basic routine cleaning they will stand the test of time. High traffic fixtures and hardware like faucets and door handles will be more at risk for spotting and wear from the natural oils on your hands. Often, the most effective care routine for bronze fixtures is simply wiping down the hardware with a soft cloth after each use. This will remove the oils and prevent corrosion of the finish. 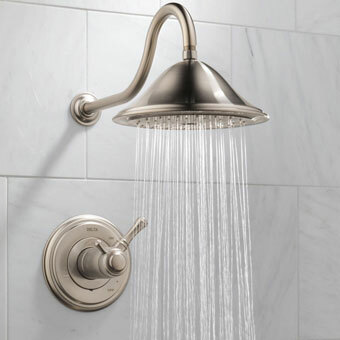 Bronze bathroom and kitchen faucets, bronze shower heads, and other bronze fixtures that come in regular contact with water may be susceptible to spotting. Most Oiled Rubbed Bronze finishes are generally spot resistant, but if spotting does occur, the easiest way to clean the fixture is by rinsing it with water then drying immediately with a soft cloth. Water is generally the only solution needed to keep your bronze fixtures and hardware clean. In some cases you may need a stronger solution to clean your bronze hardware, such as hairspray on your bathroom faucet or food on your kitchen hardware. When a stronger cleaning solution is needed, vinegar diluted with water is the safest choice for all bronze finishes. You can also use a soft, damp sponge for trickier spots. Although bronze fixtures and hardware are very durable, they should be gently cared for with soft materials. Avoid using harsh chemicals like bleach and other cleaning substances that may cause irreversible damage. As we previously mentioned, a soft cloth or sponge is the best recommended cleaning tool. Do not use abrasive scrubbers like steel wool or scratchy sponges. 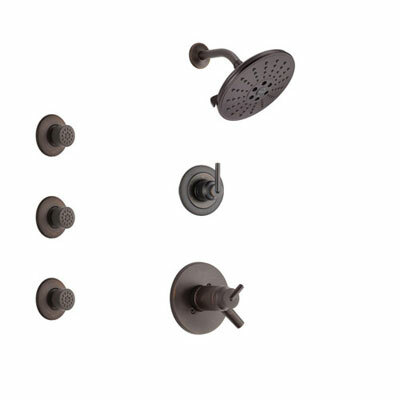 If you have installed non living bronze fixtures and hardware in your home, you will not have the same aging issues as other live finishes like Oil Rubbed Bronze. Finishes like Delta's Venetian Bronze are created in such a way that they are not living, and will not succumb to the same wear over time. 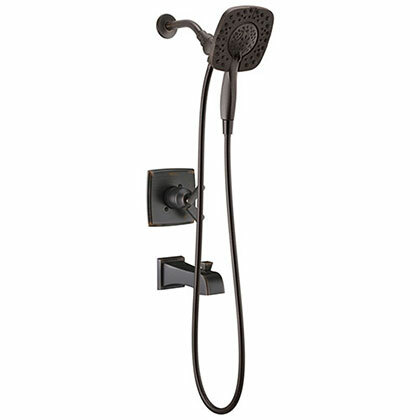 Venetian Bronze fixtures and hardware will also need considerably less care and maintenance over time. If you are wanting a more uniform design throughout your house for years to come, Venetian Bronze may be the best choice for you and your home. 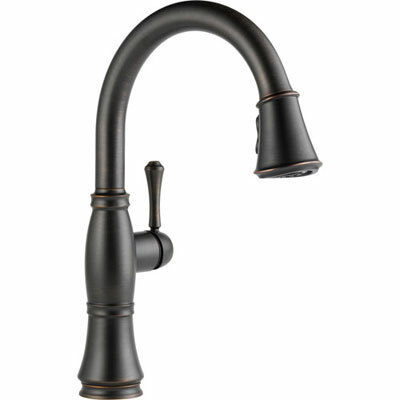 Conclusion - Add a Beautiful Bronze Fixture to Your Kitchen or Bathroom today! The bronze fixture trend has stood the test of time. Both Venetian Bronze and Oil Rubbed Bronze are traditional, yet versatile enough to look amazing in nearly any home design. 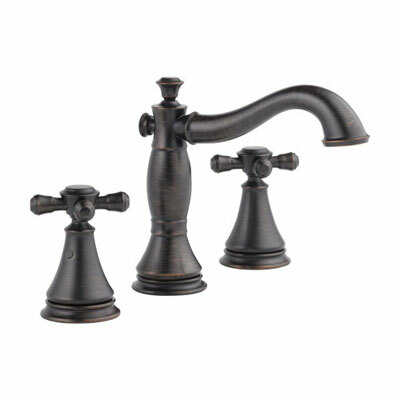 Regardless if you choose a living Oil Rubbed Bronze finish, or a non-living Venetian Bronze, bronze fixtures for the home are incredibly durable and long lasting. Give bronze fixtures a try, and leave a comment with a picture of how you incorporated these classic finishes in your home! Please subscribe to our Newsletter for more design tips and ideas by entering your email address in the field below the comments section. Thanks!